Knives permeate into every facet of human existence. From being brandished in some backstreet alley in a Hollywood film, to being brandished at your favorite restaurant, knives are used constantly as one of humanities greatest tools. For the hunter this is particularly true. No hunter should ever be without some form of cutting tool. Not only are they vital in the process of butchering a kill, they are also a multipurpose survival device. This means that having the best hunting knife that is suited to the task at hand is incredibly important. In the US alone, the hunting knife industry accounts for $5.722 Billion. It’s a massive industry and this leads to a lot of diversity in the hunting knife market. For the new consumer who wants to have an exclusive knife collection and even the seasoned professional, this can lead to the purchasing of a new hunting knife an arduous task. The aim of this article is to give the reader the necessary information needed to select the best hunting knife for them. Different features on these knives will make them more suitable for each consumer. One may want a serrated edge, another may want a glass breaker. By the end of this, you will know the best hunting knife for you in 2018. Types of Hunting Knives: Which One Is Right for You? What to Look for in a Hunting Knife? Serrated Edges vs Fine Edges: Why Do We Need Them? There is a massive amount of data available online in the hunting knife industry. It can be hard to know which opinions and reviews to follow. I would not ask you, the reader, to make a decision based on this without first knowing something about our process. Here at Stuffoholics, we have been running product research in a methodical and reasoned way for the past 5 years. We pride ourselves on giving unbiased, balanced reviews. To do this several people are involved in each review piece, with over 96 hours of research being done. We are also not affiliated with any single brand, and have no monetary incentive to try and increase sales of any of them. Our research process started with over 61 different products from 19 different brands. We then shortlisted 22 of them and reduced that number to the best 10. Our selections are meant to be applicable to a large variety of users, from the home user to the professional. Whoever you are, this piece will be fit for you. Folding knife – Folding knives are knives with blades that can be folded inside the handle of the knife. They are easier to carry due to their ability to half their length. 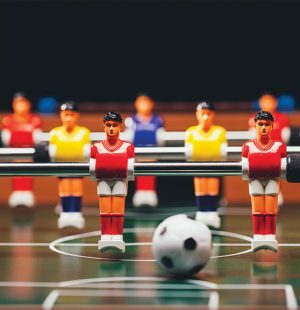 However, the addition of a moving part can lead to issues with reliability over a long period of use. Fixed knife – Fixed knives are knives in which the blade cannot be moved. They are commonly supplied with a sheath for safety reasons. Unlike with the folding blade, the fixed knife blade tends to protrude into the knife handle, making it stiffer. This is called “the Tang”. Fixed blades are where we tend to find a larger variety of features. Bowie hunting knife – The Bowie hunting knife is a popular form of the fixed knife. The original design was large bladed and simplistic in design, with a crossguard on the hilt. Hugely popular in the US since the days of the Wild West and still popular with hunters and survivalists. Modern designs have not changed much, only increasing the quality of materials and adding a serrated edge where needed. Blade type, material and thickness: These criteria will determine how effective the blade is in whatever function you use it in. Blade type – Blade type applies to the shape of the blade. This can be split into the point and the edge. In hunting knives points include; drop point, clip point, spear point, roach belly and trail point. Edges are split into two types of grind. Hollow grind and Scandinavian grind. Hollow grind means the edge curves to the point, whereas the Scandinavian grind starts higher up the blade and does not curve. Material – This will define the blades stiffness, corrosion resistance and how well it keeps an edge. Almost all hunting knives are made from one form of steel or another. We will go into this more in each knife review. Thickness – This will change the blade’s usability, whether it is for chopping wood or skinning game. Hilt type and material: This is the area in direct contact with your hand so it’s just as important as the blade. Hilt type – This is the shape of the hilt, normally it is either bare or molded to fit people’s fingers. Material – The hilts material must be able to be rough enough to not slip out of your hands, but also not absorb blood and other fluids. Features: These are extra features that are added to the knife, such as a glass breaker, lanyard holes or a gut hook. These are specific to certain situations. Warranty and attachments: If you are in the market for a hunting blade, the likelihood is you are looking for a reliable knife. But not all blades are perfect, so it is nice to be able to rely on a warranty if anything happens. Especially if it is an expensive knife! Attachments are things included with the blade, such as a sheath (a must have for a fixed blade) or a set of detachable blades. As you can see from this there are more situations in which a fine edge could be used. Fine edges are also easier to keep sharp, you must have a special tool to sharpen a serrated edge. However, as there are no clear disadvantages to going with a blade with both serrated and fine edges if you are going to be hunting I would recommend that option. There are a number of situations I have been in where having both would have saved me considerable time and effort. Over one thousand user reviews and opinions were reviewed and analyzed before any selection has been made. This also gave us a greater understanding of what the average user want’s and does not want from a hunting knife. 60+ products were analyzed in this way. From these 60+ we shortlisted 22 of the best. 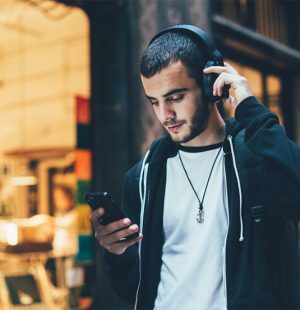 At this point we began to do more in-depth analysis, visiting supplier websites, unaffiliated online stores and most importantly, critic reviews. These are from professional hunters and enthusiasts who have had time and hands-on experience with the knives themselves. Analysis and product research was carried out on 19 different brands through a side by side comparison. A group of volunteers from a variety of different backgrounds were used to provide feedback on these specific after using them at home. These volunteer views were then matched against the research data mentioned earlier to provide an online and in hand analysis. We have analyzed and tested different types of hunting knives to understand the versatility and usability of their features. Blades were used on their respective recommended materials to see effects on wear and sharpness and to prove their suitability and function. 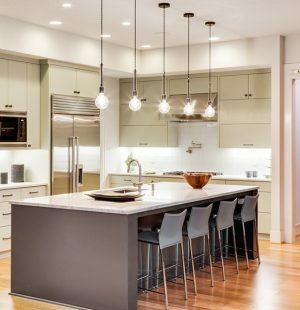 The prices, dimensions and features mentioned are all for the reader’s guideline. From these test criteria, and using all available data, we have selected the best 10 hunting knives. Without further ado. Below you will find the top 10 products. 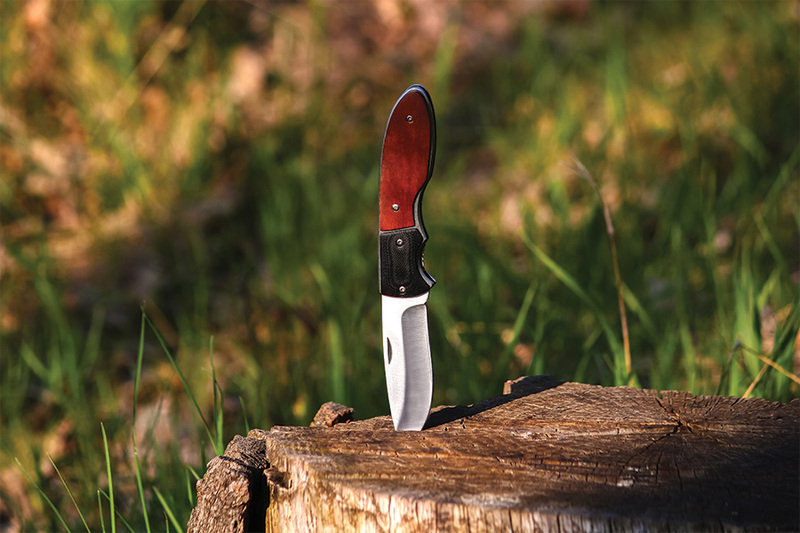 Reviews focus on 29 key features that a hunting knife can have. Most of these features have been taken from the manual/specification sheets of each product some have been added to give the reader more information. Pricing was considered in each review, knives in this list have been selected because their value per dollar was seen to be good. We want you to get the most ‘bang for your buck’. All data used has been seen to be up to date to you an accurate view on the best hunting knives of 2018. Reviews will be split into: Design, Ease of use, Features and Other Factors. Before I jump into the review for this product, let me first tell you why it has been selected as our first pick. Out of the 29 features analyzed this product comes with 12. This was not the highest number of features but it has a higher average review score compared to the other products in our list. Excluding unnecessarily overpriced models and cheap poor quality hunting knives, the price of this model comes very close to our budget pick. At below $10 it comes in as a very affordable choice. It has the highest number of reviews on Amazon (7,055) and a very good average rating of 4.4 out of 5. It is also very popular, receiving 10 reviews in less than 5 days. This means that not only is it well reviewed, it is also very popular. There is a range of different styles available with this blade from the supplier. 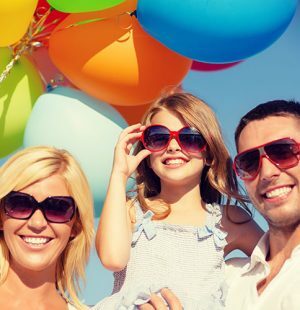 Although it is not one of the main criteria used in our reviews at 10 different colors, it is definitely an added bonus! Colors are as follows Black, Fall Camo, Grey, Orange, Pink, Pink Camo, Rainbow, Red and Red Camo. The TF-705 is definitely an eye-catching hunting knife. Acute angles give the knife a dangerous, futuristic look that many consumers love. This is a spring assisted folding knife with a 3.25-inch blade that folds down to a total length of 4.5 inches. The blade itself is made from 705 stainless steel, which is durable and should remain sharp for long periods of time with regular care. The hilt is made from aluminum with a plastic overlay which will keep the weight of the handle low while also providing corrosion resistance. This is a folding knife so the first thing consumers will want to know is the folding method. It is spring assisted so opening the knife is easy, done through opening a catch which will click into place when the blade is closed. Aluminum and 705 stainless steel are corrosive resistant metals so should last a long time before tarnishing. 705 steel is also used in the machining industry where edge retention is a must so with proper upkeep the blade will remain sharp. In hand, the knife feels solid and has a reassuring weight of 4.8 ounces. The hilt fits well into the hand although it begins to dig into the palm when used over long periods. The hilt also has a raised finger guard on the blade side of the knife. For a small folding knife, the TF-705 is packed with features. Starting from the blade we have a drop point tip, perfect for finishing off a kill, which leads down into a semi-fine semi-serrated edge. The fine portion takes up around 60% of the upper blade, with the serrated portion taking up the remaining 40% down to the hilt. There is also a lanyard hole. The hilt itself also has three more lanyard holes. The hilt contains a bottle opener, a flat head screwdriver/glass breaker and a pocket clip. The only issue I could take with this is that to access the bottle opener the blade must be in the open position. At around $10 this blade is a bargain, but with the large number of positive reviews I would say it is not a poor quality knife. Although no warranty is mentioned, at this price point it would be unusual. I like this knife. It packs a large number of useful features into a small package and feels sturdily built. The price is also a big plus for me. However, the hilt has an uncomfortable grip and I don’t like using the bottle opener with the knife open. 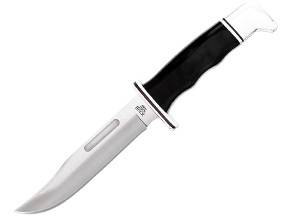 This high quality stainless steel fixed blade is a no-frills, utilitarian hunting knife. It comes with a sheath, and its simplicity is its main attraction. As before I will give you our reasoning for this selection before going into the review. Out of the 29 features analyzed this product has 13. This is greater than our top pick but wasn’t chosen for other reasons. The price of this product is still fairly low, at $14.50. But it’s this that made it our runner-up for the best hunting knife. 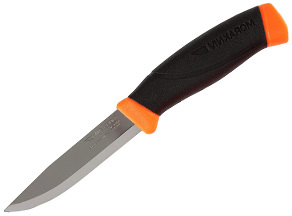 The Morakniv also has a lower number of reviews in comparison to the TAC (2,840 vs 7,055). However, it does have an average review score of 4.8 out of 5, very impressive considering the number of reviews. It has also received 10 reviews over the space of a week. This is another knife with a wide array of colors available, but they aren’t quite as impressive as those found in the TAC. Colors are as follows Black, Cyan, Desert Tan, Grey, Green, Magenta, Military Green, Navy Blue. This is definitely a function over form knife, with a complete lack of adornment this is the knife for the utilitarian, which many hunting enthusiasts will be. 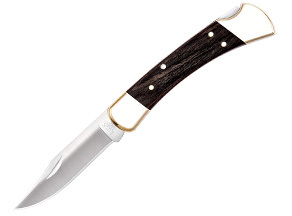 This is a classic fixed blade, drop point knife with a 4.1-inch blade and an overall length of 8.75 inches. The blade on the Morakniv is a real stand out point, made from Swedish Sandvik 12C27 stainless steel this blade will remain razor sharp for longer due its high hardness rating and toughness. The handle is another simple affair with no decorations or unnecessary additions, made from plastic with a rubber midsection that is patterned for performance in both wet and dry scenarios. This is a fixed blade knife and is provided with a sheath. The blade fits into the sheath easily and sits there securely, even during drops and knocks. As with TF-705 the blade is made from stainless steel, so when well kept there should be no issues with corrosion. A plastic handle will also have no issues with corrosion and will not absorb blood or other fluids. As mentioned before the blade on the Morakniv will keep an edge over long periods of time due to its hardness rating (HRC 56-58). In comparison to the TF-705 this knife is lighter by almost an ounce at 4.1 ounces, making it great for hunters traveling light or even ultralight backpacking with different hunting gear like binoculars, guns, bow and arrows, apparel, and so on. The handle is designed well and fits snuggly in the hand, the rubber forming slightly to the shape of the hand to prevent any slippage. The hilt also has a small finger guard on the sharp side of the blade. The price is $5 more than the TK-705 at around $14. But as before this is very cheap for a high-quality hunting knife. Another surprise is that this blade comes with a limited lifetime warranty, This is great to see at this price point and gives confidence in the reliability of the blade. This is a great, simple knife. If you are looking for a knife that looks cool and packs in a large number features, this is not the knife for you. The only issue I can find with it is the lack of features, but when looking for a hunting knife, sometimes simplicity is the best option. This futuristic looking knife and tool kit boasts of a titanium-coated blade and hilt that makes it extra durable, rust-proof and surprisingly affordable at around $7 only. As before I will give you our reasoning for this selection before going into the review. Out of the 29 features analyzed this product has 14. This is more than both the top pick and the runner but was made neither of these for reasons below. As the budget pick, this is the cheapest knife out of 10 knives reviewed. At $7.45 it is very cheap. Again we have a drop in the number of reviews from the Morakniv to the MTECH(2,840 vs 1,580). The average review score is high again, at 4.5 out of 5. 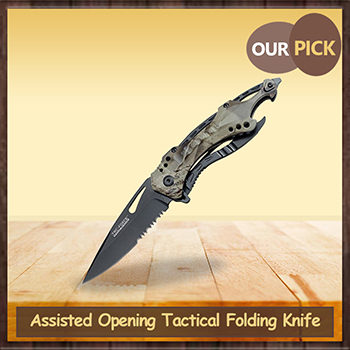 It has also received 10 reviews in less than 6 days consecutively, this is a popular knife. Although this knife has less colored version than both knives, they are still impressively vibrant and eye-catching. Colors are as follows Black/Gold, Black/Green, Black/Purple, Gold, Gold/Silver, Silver. If you want to look like a space pirate from the future then this is the knife for you. The design itself is very similar to that of the TF-705. 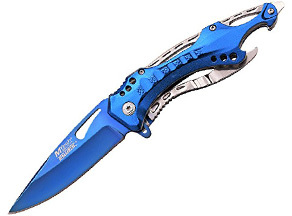 Another spring-assisted folding knife, MTECH outmatches the TF-705 with a 0.5cm longer blade, whilst still keeping the overall closed length the same at 4.5 inches. The blade is again made from stainless steel, the designation of steel is not referenced but due to the 705 in the title we can assume it is 705 again. But this blade is supposedly also coated in titanium, which is surprising at this price point. The hilt is aluminum coated with titanium. The folding design on this knife is the same as the TF-705 and performs exactly as before. The blade and hilt are slightly different to our top pick though as they have been coated in titanium, titanium is fantastically durable and corrosion resistant and is normally only found on high-end knives. This means that this knife should be even more durable and resistant to tarnishing than the TF-705. The weight of the MTECH is the same also and has that same reassuring feeling. Unfortunately, the hilt design has also the same uncomfortable grip with raised edges that dig into the palm over long periods of use. At first glance the blades look identical, but on closer inspection this blade is missing the serrated edge found in the TF-705. Opinion is divided on the use of combination blades and whether having the blade split into two smaller edges is actually detrimental to the blades performance for hunting and survival. For hunting I would certainly prefer a longer blade of just one edge, but that is only my opinion. The knife has the same; lanyard holes, bottle opener, flat head screwdriver/glass smasher and pocket clip, with the same issues. At around $7 this is the ultimate budget pick, reviews are again good and proliferate. So I assume that quality is good overall (the knives may be made in the same factory). Warranty is again unsurprisingly not included. 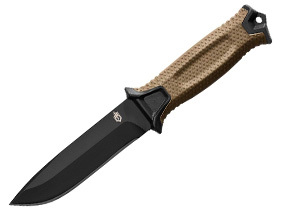 This is the TF-705, just with some slight finish changes and the loss of the serrated edge, but at a cheaper price. So if you are not interested in a knife with a serrated edge I would recommend this one. Aside from its historical background, this huge bowie knife is known for its legendary performance in hunting and survival scenarios. Its cutting edge is known for its sharpness, and comes with a leather sheath for protection. As before I will give you our reasoning for this selection before going into the review. Out of the 29 features analyzed this product has 19. This is more than any knife before it in the list but it has been selected more as a bonus pick due to its price point. As the advanced pick, this knife is far more expensive than the other at around $70. 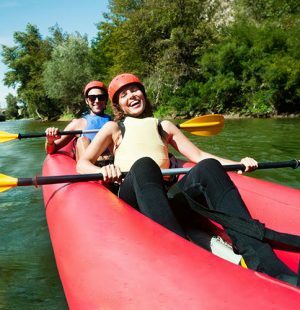 This product has a large number of reviews (1,910) with an excellent average rating of 4.8, but with the price in mind this is to be expected. No color options are available, but this is not the kind of knife that comes with paint finishes. The design on this blade is very different to the others due to its huge size. When compared side by side this is more likely to look like a sword than a knife. A bowie knife design that has made little changes since the second world war, where it was used extensively by US marines. 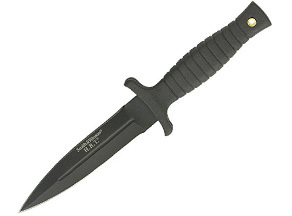 The blade is 7 inches long with a total knife length of 11.8 inches – this thing is a monster, perfect for combats. The blade is made from 1095 Cro-Van steel, which means it is a steel that contains elements of Chromium and Vanadium to increase durability and hardness. This is a very high-performance steel that is built to perform in some of the worlds harshest environments. The hilt is made from leather with a gold plated brass crossguard and pommel. Gold is not the most durable of metals, which makes me think that this is more of a presentation piece. Not to say it won’t perform in the field, but those presentation parts may last a shorter amount of time. The knife is also supplied with a rugged leather sheath that has a clip for the hilt. This is a bowie knife design and is supplied with a sheath. The sheath comes with a clip to secure the hilt of the knife and it sits securely within. The 1095 Cro-Van steel used differs from most stainless steels in that you can sharpen it on a variety of different stone surfaces. This means that as a survival knife this is perfect. There will also be little effect from corrosion on a high-performance material like this and it will keep an edge for longer than stainless steel blades. In hand the blade feels large and at 16 ounces it is also heavier than the other knives. That is not to say the knife doesn’t handle well and once you get used to the added weight and size it feels natural to hold. The overall size makes it unsuitable for people traveling light, but for hunting and general survivability, this extra weight and size will become very useful. The Ka-Bar has a full crossguard left over from its days as a combat knife. The hilt sits well in the palm and the leather prevents slippage, leather is also resistant to absorbing liquids and hard wearing. 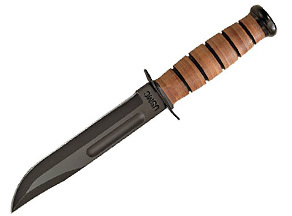 The Ka-Bar is a no-frills attached combat survival knife as befits a US Marine. This means there are no bottle openers or glass breakers. Starting from the blade there is a clip point tip, this leads down into a fine edge blade stretching 7 inches down to the handle. There is also fine on the opposite side but only in the clip section. And that is it. At $70 this is no cheap knife. As a comparison, you could buy 7 of our top picks for this much and still have change. As expected the Ka-Bar comes with a warranty, this is for real defects, not general wear and tear. The only issue I can find with this knife is the price. But knowing the celebrity surrounding it I can understand some price inflation. Gold edging is unnecessary for a survival knife, but it’s more of a niggle than a minus point. However, for that money you do get one hell of a knife. There is a reason that the Ka-Bar is known as one of the best hunting knives in the world. This folding knife dates back to the last century, and is definitely one of the classics that are known for their high quality design, performance and long-lasting sharpness. It also comes with a lifetime warranty. This is a classic hunting knife design, understandable considering the design originated 110 years ago. This is a lock blade folding knife design with a 3.75-inch blade and a closed length 4.875 inches. 420 high carbon steel is used to form the blade, this is an industry standard. There is also stamped ‘Buck 110’ just before the blade meets the hilt which is a nice touch. The hilt is made from Walnut wood and brass and is beautiful. This is a standard grip design from 100 years ago. The knife is also supplied with a rugged leather pouch and a belt clip so carrying is easy. The folding method for this knife is classic lock blade with no spring assist, which I like as a spring assist is just another component to go wrong in my mind. Steel used in the blade is stainless and the hilt is brass and lacquered walnut wood so corrosion should not be an issue when the blade is properly cared for. As mentioned earlier the blade is made from 420 HC steel; however, it is also treated with Paul Bos heat treatment which will give the blade that added edge retention. At 8 ounces this is no light blade but this is to be expected when brass bolsters are used and it still handles well. The hilt has a comfortable grip and feels good in the hand. The blade on this knife is clip point which is great for detail work, piercing and slicing. The fine edge blade stretches from the tip of the blade until just above the hilt. Its another simple classic like the Ka-Bar that focuses mostly on the blade, which I really like. At $33.50 this is not a cheap knife. But what you are paying for here is long lasting quality. A number of reviews posted pictures with their old Buck 110 knives, some over 50 years old! The blade also comes with a lifetime warranty, which is great. 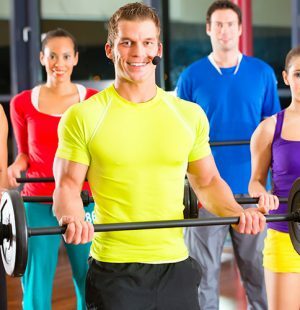 Customers also say that they have excellent customer service. A great huntsman’s knife. Simple and perfect for what it is designed for. It’s a bit pricier than some of the other knives on this list but you’re paying for quality and reliability. The addition of special hardening treatment on the blade is a bonus also. This fixed blade weapon features a spear tip that would work well in defending yourself against aggressors. Plus, the rubber handle gives you a strong, comfortable yet secure grip on the knife. This design is primarily a self-defense weapon. A fixed knife with a double edge blade that extends 4.7 inches and forms a total length of 9 inches, it certainly looks quite menacing. The hilt is a no-nonsense black rubber wrapped around the blade tang. Black is used across the knife. This is a fixed blade and is provided with a synthetic leather sheath, unsurprisingly in black. The sheath is durable and fits the blade securely. The blade is made from High carbon Cr-Mo-V stainless steel, a lower grade of steel than our other fixed blade knife, but should still perform well and keep an edge. No information is given on the black finish of the blade but the stainless steel and rubber handle will be resistant to corrosion. Rubber is also very resistant to liquids. The handle is my favorite part of this blade, it fits the hand well and is secure, It also features a full finger guard, a standard grip on the most self-defense knife. The blade on this knife ends in a spear tip, it is a self-defense weapon so is not designed for hunting purposes, only for puncturing wounds. There is also a hole in the end of the hilt, this should be the right size for a piece of string to go through. Another simple design with low features. At close to $15 this blade is quite cheap. No warranty is supplied but this is understandable. 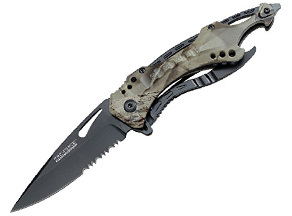 If you are looking for a hunting knife I would not recommend this blade, it is a self-defense design. I do like the comfort of the hilt however and the price for the knife is in the low end. 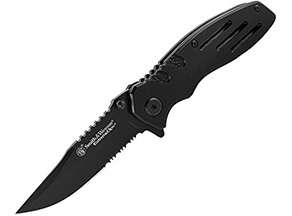 This black beauty from Smith & Wesson features an easy to open blade with a thumb knob and a liner lock. The blade is very sharp and sturdy, and comes in a handy size that’s easy to carry in your hand or pocket. Another black knife from Smith & Wesson! This time we have a folding knife. The blade on this knife is 3.1 inches with a folded length of 3.5 inches. 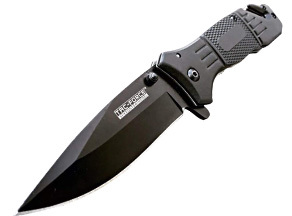 The blade is the same material as the previous Smith & Wesson version, again finished in black. The hilt is Aluminium with the same black finish and there are slits removed to reduce weight. The blade on this knife is very easy to open with the thumb knob. No spring-loaded assist here but that is not a problem. A liner lock keeps the blade open, but some customers have mentioned that this has failed on them, which is very dangerous. The black finish on the blade and hilt are said to be black oxide, which has excellent resistance to corrosion. The steel used is the same as in the review before this and will have the same edge retention and durability mentioned there. The hilt on this knife is surprisingly comfortable and comes with a raised finger guard on the blade side of the hilt. All features on this knife are in the blade. Starting at the tip we have a clip point, what is odd here is that the clip side of the blade is not sharp which reduces its usability. The fine edge stretches down 60% of the blade into a serrated section for the rest of the blade. On the opposite side of the blade we have a striker portion that can be used to start fires. The hilt contains no features, which may be what makes gives it such a comfortable grip. However, this is a great choice for outdoor use. At around $12 this is another cheap blade. No warranty is supplied with the knife. This is not a bad knife for the price, which makes it such a shame that it is let down by its locking mechanism. This for me is a catastrophic failure and would prevent me from even touching this knife. This knife may be a bit on the pricey side, but it is definitely worth the money! Beautifully designed from blade to hilt, it has a diamond textured rubber grip and black ceramic coating that is corrosion resistant and stays sharp for a longer period of time. This a beautifully designed knife. The blade flows very nicely into the hilt and I like the colors used. A fixed blade knife with a blade of 4.8 inch knife and a total length of 9.8 inches. The metal used in the blade is the same as in the Buck 110 and is finished in black ceramic. The handle is made from glass-filled nylon and has a rubber overmold and a diamond pattern. The brown color on the hilt looks good as well. Available in Black and Coyote. This is a fixed blade knife and comes with a sheath. Its a great sheath with a snap in Molle strap. This means that the knife can be carried securely vertically and horizontally. The 450 HC stainless steel used is the same high quality in the Buck 110 and retains an edge just as well. It is finished in black ceramic, this is fantastic at preventing corrosion as it contains no metal. The hilt materials will help reduce the weight and they are also resistant to corrosion. The weight of the knife is 7.9 ounces. Which is heavy compared to some of the knives in this list but this is due to the width and length of the blade. The rubber and diamond pattern mean that the hilt fits very snugly into the handle and is very secure. The finger guard is also on the hilt. There are two different versions of this blade – serrated and non-serrated. The serrated edged version has a small serrated area, taking up around 30% of the blade. The fine edge version is edge until the hilt. The end of the blade is a drop point, great for both finishing off a kill and finer handwork. There is also a hole in the end of the hilt for string. At $62 this is one of the more pricey blades on this list. It comes with a limited lifetime warranty. Another really good simple knife. It’s a shame that it isn’t cheaper but you can feel the quality when the knife is in your hand. I think another real standout point with this is the sheath, an automatic snap-in locking mechanism is a really good addition. This $8 knife stands out with features that make it useful for emergency situations, among these are a seatbelt cutter and glass breaker, a unique feature among the rest of the items on the list. It’s another black knife! This is a spring assisted folding knife from TAC. The blade on this knife is 3.25 inches with a length of 4.5 inches when closed. The blade is stainless steel and the hilt is aluminum both finished in black. The blade on this knife has a small knob to help with closing and is spring-assisted. The blade flips open very easily using a lever near the top of the hilt on the knife. No issues with holding open the blade also using the locking mechanism. The steel is listed as stainless steel but no specification on this steel is given so I can’t comment on how well it will keep an edge. But this will serve you well if you keep sharpening it regularly. The aluminum hilt is good in the dry but can slip out of the hand when it is wet. The blade has a drop point with a fake edge on both sides. The fake edge on the non-edge side is not sharpened and seems to be pointless. In the hilt you also have a pocket clip, seat belt cutter, and glass breaker. The inclusion of a specific cutter for seat belts is interesting and would make this good for a bug-out bag in a car. It can also be used to easily and accurately cut fishing reel. At $8 this is one of the cheapest blades on the list. No warranty is included. It’s a cheap knife, but seems reliable. The seat belt cutter is an interesting inclusion. Although not perfect for hunting this would be a good knife to keep handy in a car due to the seat belt cutter. A very classic look for a fixed blade knife. Myself I don’t like the way it looks but that is only me. The blade is 6 inches long, the second longest on this list with a total knife length of 10.5 inches. This is a big knife. It features the same 420 HC steel used in the previous Buck knife on this list. The only knife on this list to feature palm swells on the hilt, which is made from cocobolo with brass pommel and finger guard. The wood version is the best looking. Available in Black and Wood. This is a fixed blade knife and comes with a modular sheath of leather that extends over part of the handle to keep it secure. The steel is the same as in the Buck 110 and will have the same attributes. The hilt is my favorite part of this knife, combining Bolo wood and brass into a very comfortable and easy to hold grip. The weight is 7.5 ounces, not bad on a knife with this blade length. It is easy to handle due to a well-designed hilt. The end of this blade features a clip point with a slight curve to the clip. It also has a fuller (indent on the blade) to reduce weight. A fine edge stretches the length of the blade. At $54.74 this blade fits into the higher end of the knives on this list. But again its comes with Bucks lifetime warranty. Customers also say that they have excellent customer service. Another good knife from Buck. Its price definitely puts it into the higher end but it does perform well. And I love the sheath included. The blade keeps its edge very well as with the other Buck knife in this list. False Edge: A part of the top edge of the blade which is sharpened as well to improve piercing, making short precise cuts and as a backup blade. 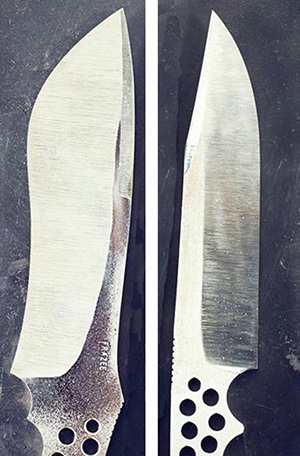 If the False edge extends throughout the knife, it becomes a Double-Edged Blade. Serrated Blade: Blades with sharp saw-like teeth in them. Combined Edge: Blade having both a Serrated and a Fine Edge, either on the same edge or on opposite edges. Fine Edge: A sharpened edge with no teeth. Lanyard Hole: Holes in the blade of hilt that are made for threading through rope or string. Comfort Grip: Grip on a knife handle that is tailored to accommodate each individual fingers. 7Cr17 High Carbon Steel: After describing it, Please mention that HC steels are tougher, more durable and sharper, however, they are more susceptible to rusting that stainless steel isn’t. Steel with a +2% carbon content and traces of Chromium. High carbon steels are tougher and more durable than normal steels, but are more susceptible to corrosion, and are therefore normally made into stainless steels. 1095 Cro-Van Steel: A very durable and tough steel that is hard to work, making machining it more expensive. 1095 Cro-Van is not actually a 1095 steel, this is a marketing name. Fuller: Groove machined into blade to make it lighter. Become familiar with your state’s laws on carrying knives, for instance in Delaware you may not conceal a knife with a blade of over 3 inches (Delaware Code: Title 11). If you want your knife to last it must be cleaned and oiled properly. There are many guides to doing this online. Understand where you can take your knife. It is illegal to enter schools, hospitals, prisons and military bases with a knife. Be careful with your knife, keep it out of reach of children and always keep it stored folded, or in a sheath. The knife has been an incredibly important tool throughout human history. When used correctly a good reliable knife can make all the difference when you are out hunting. It is important to understand when you need to spend money and when you don’t. If you are a professional or enthusiast level hunter who will be using a hunting knife a great deal then I would recommend one of the +$50 knives on this list. But if you are only using it every now and then, there are sub $10 knives here that would be perfect for you. This review has a ‘top pick’ and a ’budget pick’, but most of the knives here would be great for hunting. The decision on which might be the best hunting knife for you is yours to make, we have just provided you with information to give you that extra edge.